Cabin Easy Chair — O'Day Mariner #1922 "Orion"
There aren't manyboats under 20 feet that have good sitting headroom in the cabin - I mean good headroom. Enough to sit with your back straight not clobber your head on the cabin ceiling, portlights, etc. And while there are indeed a few with large enough cabins, most times the boat's performance suffers because of all the extra "boat" that allows you to be so comfortable. It's a trade-off: either you get a small micro-cruiser with a comfortable cabin and mediocre performance, or you get a small weekender with a cramped cabin and better performance. Such is the case with the Mariner. On a larger boat, every once in a while it's nice to get out of the sun, go in the cabin and read a book while lounging on one of the berths. This is a feature I missed with the Mariner. So, I thought to myself, how can I replicate that in Orion? The idea came to me when I was working on the mast support arch inside the cabin this past winter. I sat in the cubby hole (designed for a porta-potti) in order to reach the arch above my head, and I actually found it extremely comfortable. 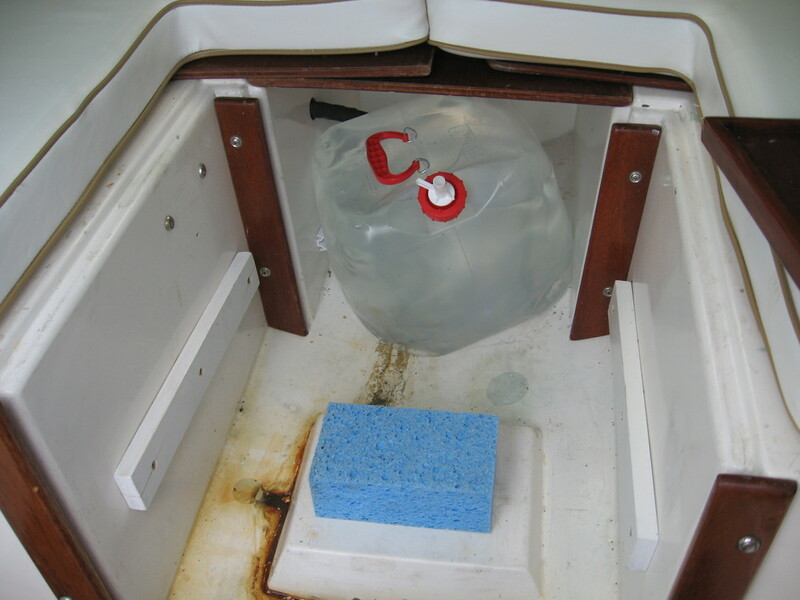 The V-berth provided perfect arm-rests, and I could stretch my feet out on either side - or straddle - the centerboard. All it needed was a little cushioning, and it would be perfect. While I was contemplating this idea, I came across a website about the Seaward Fox, an almost-20-foot pocket cruiser. The Fox was designed to incorporate, among other small cruising amenities, a "Comfy chair" in the middle of the cabin - right where I had discovered one should go for Orion! 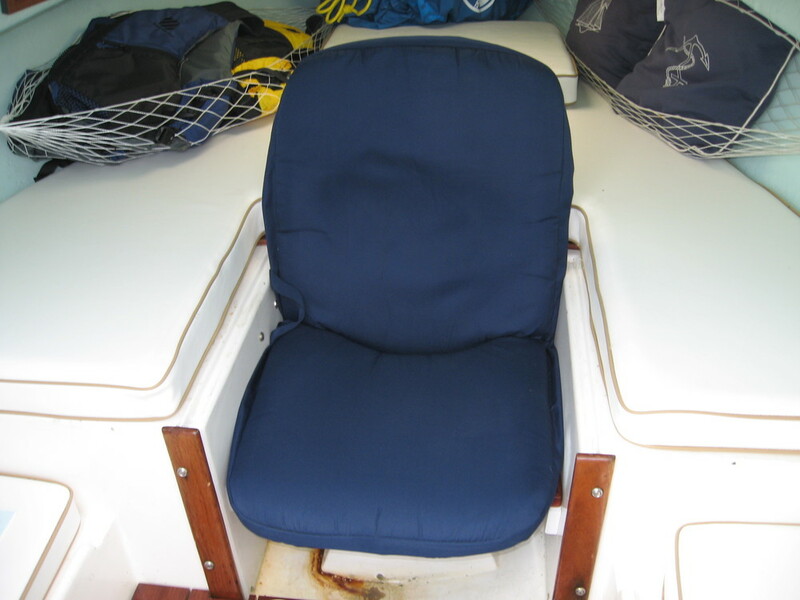 The Fox cleverly utilizes boards taken from the V-berth middle insert to create the seat and back to the chair, and the cushion is actually the "filler" cushion to complete the full V-berth. All "moving parts" have a double purpose - ideal for any pocket cruiser. I tried to use existing boards inside Orion's cabin to create a chair, but nothing seemed to work. Around that time, a sign from Heaven appeared... in the form of a sale at West Marine. Their "Go-Anywhere" chair was for sale at a good price. The dimensions fit the porta-potti space, it was very light, and it even had several ratcheting reclining positions. I stopped by my local West Marine store and picked one up. It fit perfectly, and, after sitting in it, it felt good! However, it was just a tad bit low, so I decided to raise up the seat by putting it on a platform. And while I was at it, why not make the platform useful for something else, like a table for the cockpit? The first thing I did was make the support brackets - lengths of pine painted white. I screwed them into the sides of the porta-potti space, leaning them back at an angle that I guessed would be comfortable. It's important to know that the porta-potti space is in no way square, so I used a bubble level to make sure the other side was level when I screwed that in. (You can see in the picture the one of the support brackets split on both ends - oh well.) Once those were in place, I took measurements for the platform/cockpit table, which, again, was not square - it came out to be a trapezoid that was mighty close to being square. The sides were 15" long, but the back edge was 18.5" and the front edge was 19". I then constructed it out of 1/2" mahogany plywood with the edges trimmed in real mahogany; 3/4" tall by 3/8" wide. Having it 3/4" tall left a 1/4" lip all around the edge so things wouldn't slide off the table once it was in place. More can be found about the table itself on the cockpit table page. Once I put the "Go-Anywhere" chair on top of it, it truly was as comfortable as my reclining chair at home! The headroom was just right and I could stretch my feet out comfortably. There is compromise with everything, and while this "Easy Chair", as I've named it, is a great addition, it means that I am unable to put the porta-potti in this space. I feel, however, this is a good compromise, as I would only use the porta-potti while cruising, something I realistically do only once in a great while. 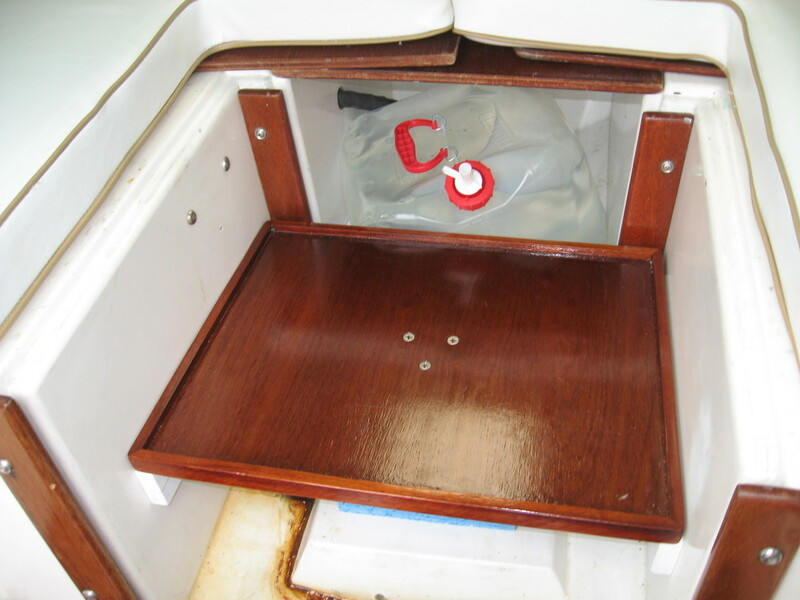 I also had Stuart Marine cut out the area from the two V-berth cushion wedges and make a cushion insert, and they did it for a reasonable price. I'm very pleased with the way this turned out. I realize that the cabin arch is what allows me to do this, as later-style Mariners (1972 and later) have a mast compression post that would get in the way. But, that's partly why I got this style boat in the first place!